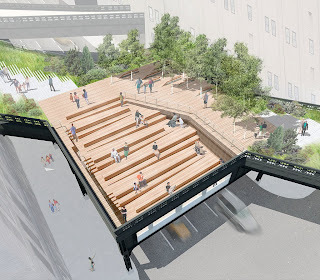 Once again, I'm putting up one of my class assignments, this one a precedent case study on the innovative High Line Park, situated in the heart of the meatpacking district in New York. The entire area inspired me to think about ways of transforming the Chinook C-Train Station and surrounding industrial area right here in Calgary. Some would say that Calgary and New York have very little in common. So why use a case study in New York when considering the transformation of the Chinook C-train station and surrounding area? The answer is that much can be learned from best practices all over the world. The key is to adapt them to the local context, make them meaningful to Calgarians. Like the Chinook area in Calgary, the Meatpacking District in New York, where the High Line Park is situated, is a post-industrial community with a strong commercial (retail) focus. They both have a freeway as part of their neighbourhood – the West Side Highway in Manhattan, Macleod and Glenmore Trails in Calgary. Where they diverge is where the learning comes in. The New York experience demonstrates how a single use commercially zoned industrial Brownfield area can transform into a vibrant livable mixed-use community. Once an area of slaughterhouses and industrial meatpacking facilities, a 1933–built elevated railway track serviced the meatpacking district into the 1980s by which time transporting goods via trucks became more viable. The railway stopped running and the elevated tracks were abandoned to deteriorate as a relic from another time. Because no one took ‘ownership’ of the structure, it was never dealt with, and then in the 1990s, several local business, landowners as well as mayor Giuliani threatened to tear it down. It took two local residents – Joshua David and Robert Hammond – who met at a community association meeting, to save the elevated tracks that eventually became the High Line Park. At first they concentrated on preservation until they realized it could become much more – a greatly needed public open green space for the neighbourhood. Along with the suspension of railway service during the 1980s, this area on the west side of Manhattan underwent significant gentrification, transforming into a hotbed for art galleries, fashion/design shops, cafes, restaurants as well as new residences and boutique hotels. The downside to this gentrification and redevelopment is that the area became less affordable. One of the well-known and much loved restaurants – Florent, who were on the leading edge of this trend, had to move out by 2008 due to an unacceptable rent increase. The increased costs for living in the area excluded less affluent residents. The Meatpacking District proper includes Gansevoort Street, West 14th Street, Hudson Street and the West Side Piers and is zoned for commercial use (dominated by retail) but not residential. Mostly brick lower-profile warehouse buildings reflect the turn of the last century’s historical roots. Residences abound in the nearby areas of the West Village, and West Chelsea. These areas are generally quieter with tree-lined streets and a comfortable neighbourhood-feel. Housing structures are predominantly townhouses (row housing) and converted warehouses with a mix of rental, and owned (including co-ops) residences. A local resident notes that the opening of the High Line Park in the area had a democratizing effect “I think early on you kind of got a fashionista, style-only crowd coming to the neighborhood, but now with the High Line you’re getting all walks of life.” In addition, residents have noted an increase of children in the neighbourhood. (Mooney, New York Times, 2010). 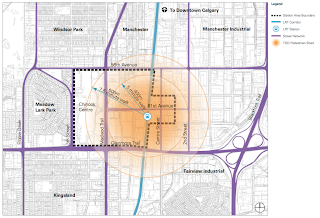 As noted in the City of Calgary’s 2008 Chinook Station Area Plan, due to the station’s enviable location as a major transportation hub, situated along the busy south LRT corridor, this could be a highly desirable area for experimentation with Transit Oriented Development (TOD). TOD principles include the following key components: get the land use right, promote density, create convenient pedestrian connections, ensure good urban design, create compact development patterns, manage parking and make each station a ‘place’. In 2006 this station had approximately 15,000 daily users boarding, making it the busiest stop along the southern line. Because this station is scheduled for an update in 2011, augmenting the current platform to accommodate trains with more cars, other important changes could be coordinated at the same time. Built in 1981,the station area (see map) which is approximately 67 hectares in size includes 58th Avenue to the north, the Glenmore Trail freeway to the south, and 5th Street to the west. There is also an area to the east of the station that includes 60th Avenue S.E. to the north, 62 Avenue S.E. to the south, and 1st Street S.E. to the east. Macleod Trail dissects the area, cutting the C-train station off from the regional shopping mall Chinook Centre. There are 2 industrial parks surrounding the area – Manchester and Fairview. Typical of developments from this era, land uses were kept clearly separated. As a result of this form of land-use planning, there are no residents in the area. The closest residential communities include Windsor Park, Meadow Lake Park and Kingsland. Retail forms the dominant land use in the area, but it does not follow a coordinated coherent pattern, rather it is laid out in an isolated and disconnected manner, often with buildings surrounded by a sea of concrete parking lot. This low-density form of development makes it convenient for car users but inconvenient for those wishing to take public transportation or other forms of transport (eg. bike, walk). Other land uses include low-level (1-3 storey) office and light commercial development. Clearly there is an abundance of underutilized land in the area. The station has a very poor pedestrian environment because roadways have taken precedent. Sidewalks often end suddenly; buildings do not front the street and have huge set backs, the overall layout make it difficult (and unsafe) to maneuver around. In spite of this, there is a lot of pedestrian traffic especially along the 61st Ave corridor, which links the station to Chinook Mall. A local example where the city initiated street improvement and infrastructure upgrades is in the East Village. By offering some street improvements, private developers will be more likely to see the possibilities of an area. 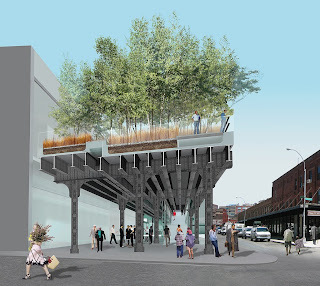 Like the old elevated railway tracks of the Meatpacking District, the current Chinook Station area have many faults but with the potential for transformation. With the successful implementation of a neighbourhood public park in this already high-density mixed-use community, there are some lessons to be learned and potentially adapted to the Calgary Chinook Station context. The intention of this precedent study is to evaluate the project (New York’s High Line Park and surrounding area) in terms of best practices, some of which may be adapted in the Chinook Station Area Sustainable Transformation plan. Using an evaluative framework, the park and surrounding area have been examined in terms of the following criteria: diversity, efficiency, accessibility, environmental responsibility and social equity/health. Each element is rated from 0 to 3, with 0 being insignificant and 3 being highly significant. The evaluative framework is derived from an adaptation of two sources – Sasha Tsenkova’s Planning Sustainable Communities: Diversity of Approaches and Implementation Challenges, University of Calgary (2009) and the Ontario Professional Planners Institute’s Planning by Design, Ministry of Municipal Affairs and Housing (2009). 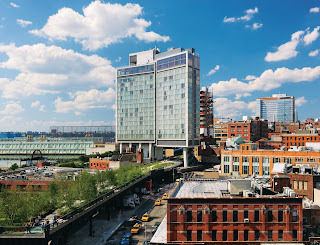 The Meatpacking District offers a fine example of high-density, mixed-use buildings all with good connectivity to each other as well to the rest of Manhattan (and beyond) via multiple forms of transportation, most obviously by subway and bus (closest subway stop is at 8th Avenue and 14th Street). Future commercial development will make use of the elevated park in a new way – as a roof structure for new development directly beneath it. The Chinook Station’s central location in close proximity to a well-used regional mall offers an opportunity to increase C-train rider-ship (and therefore decrease car usage) by altering the existing area to be a more attractive, safe and pedestrian-friendly place to visit more in line with the High Line and surrounding area. Clearly the current low-density single-land use urban design is lacking in proximity between, and shared use of, its disparate elements. If you look at current photos from the Chinook station area - along Macleod Trail for example, it is almost impossible to determine what city you are looking at. It could be anywhere in North America. In contrast, the High Line Park and surrounding area is quite distinct. Part of the distinction has to do with architecture and creative land use. Innovative design of structures like the park itself, offer a clear sense of place. The diversity of elements is there, but it is laid out in a coherent fashion, amenable to pedestrians and other non-car users. Residential housing is not offered directly in this area but in nearby surrounding neighbourhoods. As stated earlier, mobility options are plentiful. The Chinook station area offers mobility options with the C-train, but is dominated by large- scale roadways (eg. Glenmore Trail, Macleod Trail). Adaptations are necessary to create a more distinctive sense of place, making it more desirable for people to potentially live there. This includes creating a mix of residential options and amenities like desirable public space. In terms of housing, there is a great opportunity to offer affordable housing as part of the new residential developments. Offering incentives for developers such as bonusing is one option to ensure a certain percentage of housing is retained for lower-income families. The proximity to the C-train makes it easier for such families not to have to own a car with all is accompanying expenses. 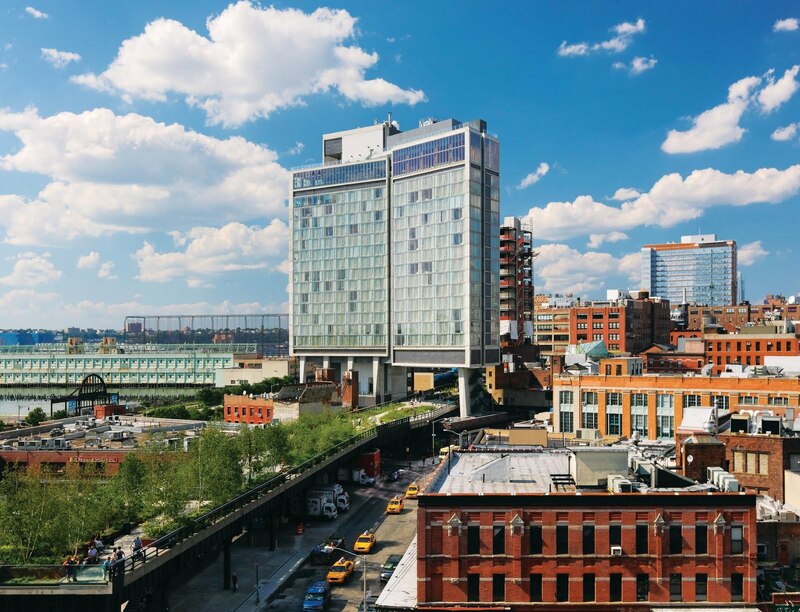 The High Line Park is the area’s newest and most-loved recreational attractions. In addition to offering a place to walk in a natural setting, there are numerous public programming options offered by the Friends of the High Line including commissioned cultural events. In terms of the greater Meatpacking area, traffic calming measures and upgrades to the street lighting and furniture have made the area more pedestrian friendly. Recently a bike lane was added on 9th Avenue. Access to the park itself is excellent, with 5 different entrances, two with wheelchair accessibility via elevators. Cutting-edge urban design offers a safe and effective pedestrian realm. The Chinook Station area comprises an activity centre in terms of its proximity to a large regional shopping centre. The current recreational opportunities are isolated within Chinook mall itself (eg. movie theatre, bowling alley, shopping, restaurants) but beyond its interior, there are much less opportunities. Outside, streetscape and street design is non-existent. There is an assumption that most of the mall’s customers will arrive by car (and not the C-train station), so street design is allocated to this priority. Little is done to connect the Chinook C-train station to this mall in a creative, attractive and safe way. One key element of a sustainable and healthy community (TOD included) is the integration of green infrastructure and construction into its plan. There are now entire communities that can be awarded LEED ND (neighbourhood) certification for their commitment to strategic environmental objectives. Although the High Line has not acquired this distinction, it does offer much needed green space in an area dominated by buildings. The addition of this public amenity has improved the livability for residents as well as offered a new destination for people from all over the world to enjoy. Public programs such as “The Great Pollinator project”, educates users of the park on its bee population, studies of the natural environment not normally found in the middle of Manhattan. And by offering multiple transportation modes for accessing the park, automobile usage (and its accompanying negative impacts on the environment) is decreased. Green roofs are now popping up in the Meatpacking District, like the rooftop of the international headquarters for the fashion designer Dianne Von Furstenberg. Built in 2007 by WORK AC Architects, in addition to the greenroof, the building uses geo-thermal heating and cooling and uses limited artificial light. The Chinook Station area, with its abundance of underutilized land, offers multiple opportunities for higher density mixed-use development that includes green buildings and infrastructure. This may include a public green space in the vicinity close to the C-train station as well as residential and office buildings with green roofs. Sharing infrastructure by accommodating mixed-uses, increasing density as well as developing a better pedestrian realm, will automatically make the area more environmentally responsible. “I think the High Line is going to create a really valuable social centre for a neighbourhood that is economically stratified, and create a place where everyone can come together regardless of income and age or background, and all have a shared public environment that’s welcoming to everyone. That is missing from this neighbourhood now.” (Robert Hammond, co-founder of Friends of the High Line in Inspiring Case Studies Leave it Better: Looking Up, Parks and Recreation). As this quote mentions, the High Line Park offers an opportunity to attract a more diverse crowd. The disadvantage to the gentrification and redevelopment that has taken place in the Meatpacking District is that it has excluded possibilities for affordable housing and has alienated those who can’t afford it. The best part of the park is that is a free amenity open to all members of the public, so provides a more democratic opportunity to enjoy the area. Any redevelopment of the Chinook Station area should measure the cost of amenities against the ability to keep them available to a wide section of the population. Offering affordable housing, and therefore maintaining economic and social diversity, must be a key objective in any transformational plan. Potential partnerships with Calgary Transit and many social agencies offer possibilities here. A careful balance must be undertaken to ensure social inclusion in the area. In terms of social interaction and inclusionary programming, the Friends of the High Line offer ongoing public programming at the park including activities for children like the “Dancing in the Sky: Creative Movement for Kids” program which offers participants a fun way to exercise. The budding dance choreographers get to show off their skills at the park’s 10th Avenue Square viewing area. Beyond the formal programming, there are numerous opportunities to exercise simply by taking a casual stroll. The Chinook Station area could be a hub of activity with diverse public programs as well as a centre that advocates for local retailers (eg. live/work opportunities). As the regional mall offers international retailers the spotlight, the Chinook Station area could give smaller, local merchants a chance to show off their wares. Better design of the pedestrian realm (such as better lighting, street furniture, and safer road crossings), could offer more opportunities to get exercise by getting people to walk rather than drive. There is much that can be taken away from the experience of the High Line Park and the redevelopment of the Meatpacking District that can be applied to a sustainable plan to transform Calgary’s Chinook Station area. Using an evaluative framework like the one here, assessing an area in terms of its efficiency, diversity, accessibility, environmental responsibility and social equity/health, offers a framework to calculate a community’s sustainability. Redevelopment must consider the long-term view, rather than quick easy fixes. Options for cost sharing must be investigated, as well as incentives for enticing innovative developers interested in creating more inclusionary developments (such as housing options that include a percentage of affordable housing or public amenity like a public plaza). Developing around a transit station offers an important opportunity to increase public transit usage while increasing density, mix of uses and beautification of the surrounding area. The High Line Park’s story can offer a cautionary tale in terms of the downside to gentrification (eg. excluding opportunities for affordable housing), but it can also offer possibilities for Calgary. If you can turn an abandoned elevated railway into a much-loved innovative urban park, anything is possible.